The polls have now closed on Bangladesh’s 10th parliamentary election. The election is contested (see debates) with opposition parties having boycotted the vote as a result of the current government refusing to step down and make room for a caretaker government to temporarily manage the country for the run-up to, and during, the election — an electoral process typically followed in Bangladesh. The head of the leading opposition party, the BNP, is reported to be under unofficial house arrest, and violence over political clashes has intensified (a reported 200 people have been killed since the end of October). Reports that the political instability has hit the country’s ready-made garment sector have already emerged (see also here). How will today’s results further impact the industry? Any investigations will require some historical analysis. You may recall the #BangladeshProject SA ran in 2010, resulting in this letter. We built the campaign because we felt strongly workers were not receiving enough media attention as they fought for an increase in their minimum wage. Since the tragedy at Rana Plaza, the plight of the Bangladeshi garment worker has received mass international coverage. We’re hoping it continues, but not just for these workers, for all garment workers world-wide. In December, a plan to provide Rana Plaza victims and the families of victims with financial compensation was announced. The plan is chaired by the International Labour Organization (ILO), and so far the arrangement has been signed by four brands, and eight stakeholder organizations: the Bonmarché, El Corte Ingles, Loblaw, and Primark and the Ministry of Labour and Employment (Bangladesh), the Bangladesh Garment Manufacturers’ Association (BGMEA), the Bangladesh Employers Federation (BEF), IndustriALL Bangladesh Council (IBC), the National Coordination Committee for Workers’ Education (NCCWE), Bangladesh Institute of Labour Studies (BILS), IndustriALL Global Union, and the Clean Clothes Campaign (CCC). You may now be wondering how it could have taken these stakeholders eight months to announce a compensation plan. 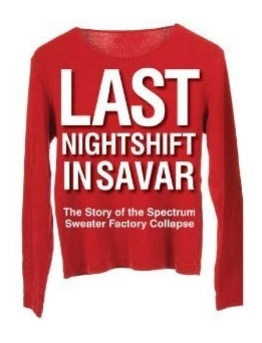 For context on just how complicated the aftermath of such an industrial disaster can be, check out Doug Miller’s (2012) book Last Nightshift in Savar, which tells the story of Bangladesh’s Spectrum Sweater Factory Collapse (April, 2005). Miller gave a talk on the story and the book back in September 2012 – click on the audio below to listen, and here for the slides. I have now added it to our required reading list, and suggest you put it on yours for 2014! As for the impact of Bangladesh’s current political turmoil on the industry? We’ll have to wait and see. This entry was posted in Bangladesh, Responsibility and tagged Bangladesh; elections; political unrest; garment sector; Doug Miller on January 5, 2014 by Mary Hanlon.